Broadly speaking, there exists two apposing camps in the battle to deliver Internet TV into the living room. On one side are devices that connect to and run on the “open” Internet: consumer-facing set-top boxes (think TiVo, AppleTV or Vudu), along with Internet-connected game consoles, DVD players and televisions. On the other side are Internet Protocol Television (IPTV) services offered by major Telcos such as AT&T. Which of the two strategies will win out in the end is yet to be seen. But one company, Microsoft, has long been spreading it bets — developing consumer-facing Internet TV products along with those sold directly to Telcos and ISPs. With yesterday’s announcement that BT will soon enable customers of its existing IPTV service, BT Vision (powered my Microsoft’s Mediaroom), to use an XBox 360 instead of its own set-top box, Microsoft has managed to bridge the gap between the two. On its own, Microsoft’s XBox 360 already offers on-demand video content through the console’s XBox Live Video Store (previously called Video Marketplace). Both Standard Definition and HD television programs (to-own) and films (rental) are available from major studios including Paramount Pictures, CBS, MTV Networks, NBC, Warner Bros., Lionsgate Films and Walt Disney Pictures. And yesterday at the Consumer Electronics Show, Microsoft announced that television shows from ABC Television and Disney Channel will be offered via Xbox Live, along with movies from MGM. From the release: More than 500 hours of content, in both standard definition and high definition when available, will be offered including hit ABC Television shows “Lost,” “Grey’s Anatomy,” “Ugly Betty” and “Desperate Housewives.” Past and current ABC shows will be available on demand, with new episodes arriving on the service the day after they air on television. 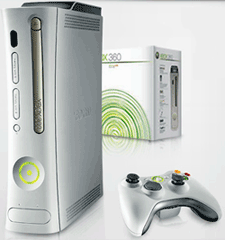 Aside from delivering on-demand video content over the Internet, the XBox 360 provides online gaming and associated social networking features: such as profiles, friend lists and the ability to send other XBox Live members voice and text messages. Last year when Microsoft announced that is was integrating XBox’s messaging service with Windows Live Messenger (previously MSM), the company described XBox Live as “the largest social network on television”. Today, XBox Live has over 10 million registered members. Offline, the XBox 360 can operate as a media extender, enabling content (video, pictures and music) to be streamed from a Windows-PC to a television. Microsoft’s Mediaroom (see our previous coverage) is described as the company’s “IPTV and multimedia software platform”, which enables broadband service providers to “deliver new connected TV and entertainment experiences to consumers worldwide.” Essentially, its the software that powers the set-top boxes offered by over 20 Telco/ISPs around the world including AT&T, T-Mobile and BT. Mediaroom is pitched as making television a more interactive and connected experience (think multi-camera viewing, content widgets and social networking). Additionally, the platform is open to the degree that service providers can build additional applications for Mediaroom. By delivering BT Vision through an XBox 360, Microsoft and BT aren’t just dispensing with the need to employ two set-top boxes, but are also hoping to combine the two platforms in potentially exciting ways. As it stands, XBox Live brings with it social features which don’t currently exist in BT’s implementation of Mediaroom, such as friend lists and Instant Messaging, and it’s not hard to see how the integration between the two could be expanded. Imagine creating your own TV guide/playlist and sharing that with friends on XBox Live. Or having authorized friends be able to see what you’re watching at any one time or to be able to invite friends to switch to the same channel so that you can exchange IMs while watching together. Note, I’m not just joining up the dots (though it’s not difficult to do so), but this is exactly the kind of “connected” television experiences that the Mediaroom team are working on, as explained in a recent conference call with last100. Notice the use of the word hobby, in what can only be a thinly veiled swipe at Apple (Steve Jobs has played down the AppleTV’s limited success, describing it as the company’s hobby). With Macworld around the corner, where Apple is expected to announce movie rentals on iTunes and possibly a major upgrade to the AppleTV, it will be interesting to see how Jobs responds. There is a rumor that HITECH-NEWS.TV is coming out with a new web tv application..and will compete with the bog boys..